Sun., Dec. 11, 2016, 5:45 a.m.
Roger Bertsch can’t stand the smell that wafts from his neighbor’s property. Sometimes it’s barely detectable in the afternoon breeze. But sometimes, he said, the skunky aroma is so penetrating he can’t keep the windows open, let alone enjoy a meal on his patio. And because of the smell of his neighbor’s marijuana farm, the Spokane County Assessor’s Office recently took 10 percent off the value of Bertsch’s property on the outskirts of Cheney, the office of the Board of Equalization confirmed this week. “Ever since they started growing cannabis, we’ve been getting a pretty intense skunk smell,” said Bertsch, who has lived in a house on West Washington Road with his wife for nearly a decade. Neither of them opposes marijuana on moral grounds – it just stinks, he said. Their situation is one reason the Spokane County Commission voted unanimously on Nov. 29 to ban new outdoor pot farms – a move that drew the ire of local industry advocates. The ordinance is scheduled to last six months as commissioners gather public feedback and consider making it permanent. 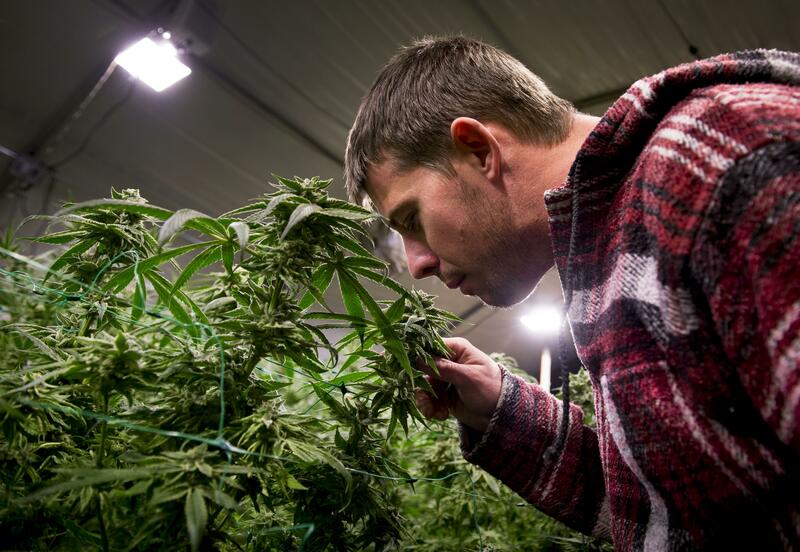 Commissioner Al French, who introduced the policy unexpectedly during a public meeting, said local officials have been “inundated” with complaints about smelly grow operations. He also sits on the board of directors of the Spokane Regional Clean Air Agency, which has tallied more than 200 such complaints since July 2014. Bang’s Cannabis has been hit the hardest, with nearly 60 formal complaints from the Bertsches and other neighbors. The business also has been fined on at least two occasions for violating Clean Air Agency standards. Other pot grows have prompted few, if any, complaints. Patrick and Lacey Bang, and their new business partner, Scott Kramer, insist they’re making good-faith efforts to mitigate odor. For example, they’ve installed several air purifiers in their greenhouses at a cost of more than $10,000. “We’re not required to do it, but we’re doing it because we want to be good stewards,” said Kramer, an accountant who’s working to bring Bang’s into the black. They also insist the smell is nonexistent beyond Bang’s property line. That rang true when a reporter and photographer visited the farm on a brisk afternoon last week. Neighbors and Clean Air Agency officials say that’s part of the dilemma: The smell can be overpowering when a complaint is filed but vanish by the time an inspector arrives, making enforcement difficult. “We are not a 24/7 agency, and odors can be very transient,” said Julie Oliver, the agency’s executive director. The right place to grow pot? Patrick Bang was a landscaper, and Lacey Bang worked for Providence Health and Services when voters approved Initiative 502 in 2012. Two years later, the couple was granted a license to grow recreational marijuana, and they set to work cultivating plants in their backyard. Now they produce about 500 pounds per year. They say their plants are all organic, they reuse soil and other materials, and they plan to install windmills to power the grow lights. “We’re a really sustainable brand, and I think a lot of people appreciate that,” Patrick Bang said. Some neighbors would appreciate stricter zoning rules that keep pot farms out of residential areas, even rural ones where homes are farther apart. Kramer said Bang’s is in an appropriate location. Commissioner French has called the pot problem “a property rights issue.” He compared it to the stench that sometimes torments neighbors of the Baker Commodities rendering plant in east Spokane, where animal carcasses are processed into ingredients for cosmetics and pet food. Flowering marijuana may reek less than simmering butcher scraps, but French said they both can infringe on a neighbor’s right to clean, odorless air. In 2003, when he was a Spokane City Council member, French pushed the city to sue Baker Commodities over odor violations, resulting in a settlement that officials said would mitigate the problem. Tony Birch lives a half-mile north of Bang’s and said he still can’t escape the odor. “In the summer, we have to keep the windows closed because the skunk smell just permeates the house,” he said. Meanwhile, Laura Gardner lives just across the street from the farm and never catches more than a whiff. The board handles permitting and ensures pot farms are up to code, but no state agency responds to odor complaints. Instead, they are forwarded to local entities such as the Clean Air Agency. “It really is a patchwork across the state,” Smith said. But some say the agency shouldn’t bother with marijuana producers. “I would prefer that the Clean Air Agency would be spending their time with pollutants that cause global warming, and not worrying about how to stifle a new industry,” City Council President Ben Stuckart said last month. This year, the agency organized a Marijuana Advisory Committee, but the agency doesn’t target pot farms. Oliver said inspectors also respond to complaints about more traditional farm odors, such as manure. The county’s moratorium does not affect existing farms or those with pending applications. Currently, 39 producers in the county operate at least partly outdoors, according to Liquor and Cannabis Board data. Greenhouses without rigid walls don’t count as indoor facilities. Editor’s note: This story was changed on Dec. 12, 2016 to correct an error relating to who confirmed that the Spokane County Assessor’s Office recently took 10 percent off the value of Roger Bertsch’s property. The office of the Board of Equalization confirmed that the assessor’s office lowered the value. Published: Dec. 11, 2016, 5:45 a.m.